Well, it's not hard to figure out the highlights of my week include my visit to London and the UK Pinterest party on Thursday evening. Do you use Pinterest? I can't imagine life without Pinterest, which probably makes me sound like a bit of a geek without a real life. Interestingly, it was probably my slightly obsessive pinning habit that got me onto the guest list - funny how staying at home and drooling over cool images can lead to a posh party invite! It's a crazy world! I think I need to do a separate post on the party and introduce you to some of the amazing bloggers I met there. Watch out for it this coming week. Oh, and my Pinterest boards are here, just in case you haven't discovered the joy that is Pinterest. Is there anyone out there who hasn't yet? I'm currently finding it invaluable for collecting inspiration for my new digital stamp images. It's like a giant digital scrapbook - with links! I very much like the way perfectly gorgeous snippets of nature are dovetailed into sometimes quite a small space creating what seems like a mini-getaway that can be enjoyed by many. I have never really understood London living (to me it seems busy, cramped and overpriced with a liveliness and culture that might of course appeal but at what cost?) but I am beginning to see why my daughter loves it. She's a city girl at heart, though, and I'm just not. the world's first unattended city shop. 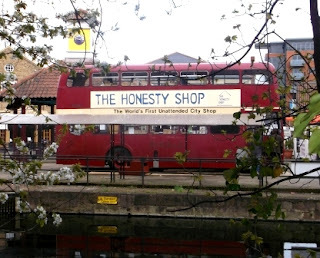 I didn't visit the honesty shop, but maybe next time. It's housed in an old double-decker bus parked in a place that hosts a weekend market with craft stalls and things that are just a bit different - so I'm told. 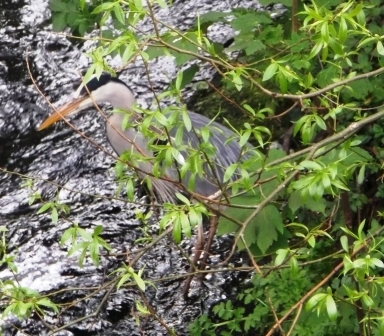 I wasn't there over the weekend this time, so maybe I'll visit it next time I'm in London - it's just a short walk from where my daughter lives and most of the walk is along that heron-populated river. In other news, if you'd be up for some digital stamp testing for me, please have a look here for free digi stamps in exchange for feedback. Oh, and yes, the vanbag got finished - more on that soon! Oooh i'm intrigued to know what you got in the good bag from Pinterest! :) Its such a fun site isn't it, i was soooooo excited when i first signed up and went a little pinning crazy!! 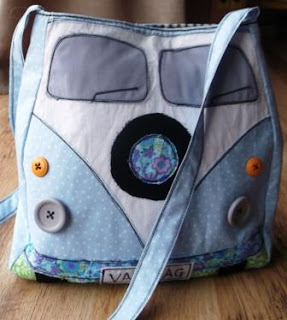 Your campervan bag is the cutest! I love the fabrics you've used. I went to the Pinterest Meetup too, but it was on Monday and there were just three of us there. What a shame our visits didn't coincide. I have signed up to Pinterest just this week. I haven't got to grips with it yet, as I have just pinned loads of my own pictures, which I know isn't meant to be the point. 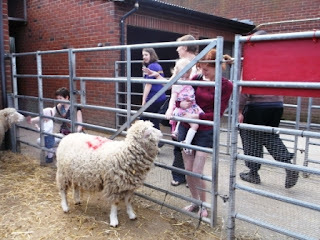 I do get quite a few visitors to my blog through pinned photos. I did a post early this week about being a bit of a technophobe. Oh I've just seen your Pinterest button, and am going to click it. I love Pinterest and look forward to hearing about your party meet up. The street markets are what I enjoy browsing when in London - Brick Lane has lots of lovely vintage shops and stalls. Campervan bag is fab! I haven't succumbed to Pinterest yet. Maybe one day. I was born and brought up in Liverpool and used to love visiting the city farm. I'm in a rural area now but still love to visit all cities. I wouldn't like to live in a city now though. 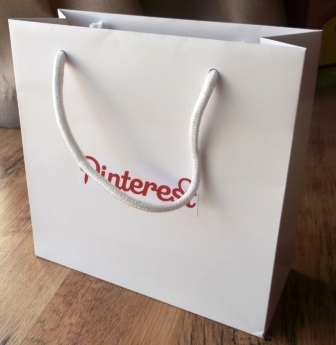 Ohhh how exciting to be invited to the Pinterest party - are you allowed to tell us what was revealed? Glad you enjoyed London and didn't get lost on the Underground! I'll tell you all about it later in the week! I forgot to mention the underground - was very proud of myself and didn't get lost once (although I did ask directions once and was helped by 2 very lovely ladies). Penny - it would have been superb to meet up with you. Maybe another time! Did Pinterest organise your meet up? I know some of the team had been in London for a few weeks. I love Pinterest, but am not sure I use it to my best advantage. I keep meaning to sit and have a big "session" with it but never seem to find the time. I'm with you on London, nice to visit, but lovely to get back to my rural hideaway - can't imagine living there at all. I love Pinterest, London and your Van bag!! Sounds like you had a fab trip! I don't use Pinterest as much as I should, despite finding some really gorgeous things to pin. Look forward to reading your post about the event. London is a fascinating place, vibrant, exhausting and nice to be able to travel to rather than live in (I was born in London and as good as it is to visit, I like going home to some peace and quiet). The van bag is great. Hope you have a good week. I was invited to that party too, London is a fair trek for me though! I'm going to be part of their blog hop in just over a week's time. Kerry (pennydog) - such a shame you didn't go, would've loved to have met you. Not sure I would've gone if I wasn't combining it with staying with my daughter. Was a lovely excuse to see her and my baby granddaughter! I understand your pinterest addiction. I actually had to drag myself away after a few days of doing nothing but going round pinning amazing pictures. It's great for inspiration though! I haven't been bitten by the pininterest bug yet. I did have a look but wasn't sure if I had to join as a business or not... I think I have to do a bit more research! I love how full of life London is, I'd love to live there but only for a year or so, I'd miss the sea. Am glad you had a great time. OO forgot to say that the campervan bag is ace! Oh the party sounds intriguing - we need more information! I've been busying doing some sketchy stitching this week, thank you for inspiring me. Thanks for hosting! That vanbag is cute!